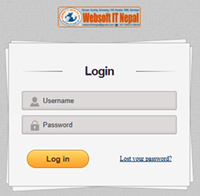 बडी फुर्सत से - Websoft IT Nepal Pvt. Ltd.
About Us Ganapati Music Pvt. Ltd. (G. Music) is established in 2018 (2075 B.S.) under the industrial Act of Nepal, as the first popular music company in local community which is situated in Katahari Rural Manicipality ward No.-2 Adarshnagar, Morang district eastern part of Nepal. It is near Biratnagar second big city of Nepal by the side of Jeevan Bikas samaj. This company is concerned with emancipation of local languages, culture, religion, tradition and art by presenting various activities related to the music and other areas. The company entertains the people by fascinating with various audios, videos songs, comedy, plays, film, serial, news, of different languages and cultures. It offers all skillful artist and interested people to present their art. The company has also physical sales of music cassettes and CDs. Its product offers to cover music videos, Television serials, and movies. It also has relation with several other music companies for digital marketing of its songs, videos and personal ring back tones (PRBTs) globally. It also hosts the largest number of music and related contents which includes volumes of original songs of different genres in Angika, Surjapuri, Bhojpuri, Maithili, Tharu, Nepali, Hindi and others various regional languages and cultures. The company organizes various musical and modeling audition programs to select skillful artists as singer, model, actor, dancer etc. It relies several religious, cultural audio videos songs, albums, film, documentary of different language cultures by the help of its own Youtube channel, webside and also from others resource as facebook, whats app, twitter, google etc. The company also fascinates people to prepare their creation of audio videos songs, film, video mixing, serials and others musical programs in its own established studio. The company always attempt to product able manpower in music area through organizing different training of singing, dancing, playing different instrument. It also acts for publishing various audio videos related to education, science and technology.